Continued from Annual Meeting (Part 1) (Wirral Council) 14th May 2013 Mayors Communications, Mayor of Wirral Cllr Gerry Ellis “It’s been an amazing, exciting, unbelievable experience”. The Mayor said he would tell people of some of the highlights of his Mayoral year. A few days after becoming Mayor he had been introduced to the Queen as she came off the Yellow Duckmarine in Liverpool. He said to her, “Did you enjoy your trip on the Duck?”, the Queen didn’t answer the question and it was later pointed out to him that it was a breach of etiquette to ask the Queen a question. Another event he’d been to had been in Woodchurch when it was raining, so sheets had been used to stop them getting wet. Unfortunately one of the sheets had blown over sending water cascading down over the Mayor. The Mayor continued his speech and referred to a good relationship with other cultures, the work of the Wirral Multicultural Organisation and the monthly citizenship ceremonies. 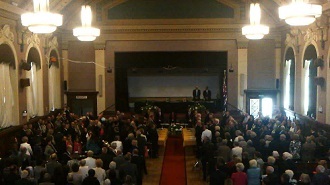 Remembrance Sunday was the first time the Mayor had been to the “splendid” Remembrance service in Birkenhead, as in previous years he’d attended the remembrance service held in West Kirby. The Cockleshell Heroes event “turned out to be one of the highlight’s of the Mayoral year” and the “best publicity Wirral had”. He loved going to theatres and the Mayor was Honorary President of a couple of theatre groups. The Chrysanthemums Pantomime Society were particularly pleased that he was Mayor as he was a former member. Such a great, fair mayor! I always enjoy his jokes at full council. Yes, his jokes made Council meetings more enjoyable.